186 pages | 69 B/W Illus. Software Defined Networking: Design and Deployment offersa unique perspective of the business case and technology motivations for considering SDN solutions. By identifying the impact of SDN on traffic management and the potential for network service growth, this book instills the knowledge needed to manage current and future demand and provisioning for SDN. "… presents and covers a well-defined cycle, from definition and implementation to development and deployment of SDNs. … The authors have used an easy-to-read narrative style, [offering] updated references for further reading. Challenges and issues arising in the design and deployment of SDN are also discussed." "This [book's] main strengths are addressing a revolutionary subject in networking, handling a principal change in the network infrastructure, emphasizing the need of open standards, evaluating strategies and solutions from leading suppliers, and preparing enterprises for more efficient ways of networking. … The approach is good, and the selection of topics is good as well. … This book will help enterprise CIOs and CTOs redesign their networks. Furthermore, it will help them sit down to serious talks with suppliers. This book also will help graduate and Ph.D students get the basics for future network infrastructure design, help suppliers select the right standards and architectures for their future switch and router products, and help solution providers select and implement the right standards and architectures combined with the best of suites of products." 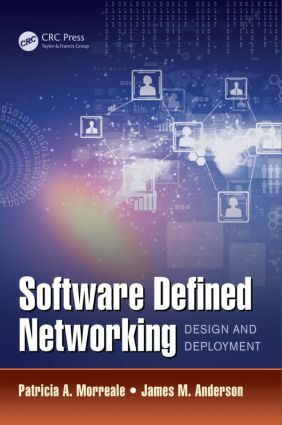 "I recommend this book as a source of relevant and valuable information about emerging SDN topics. Architectural and conceptual basics are supplemented by technical details, making this work attractive for a wide spectrum of readers." How Scalable Are Software-Defined Networks? Patricia A. Morreale is a faculty member in the Department of Computer Science at Kean University, Union, New Jersey, where she conducts research in network management and design. Since joining Kean University, she has established the Network Laboratory, building on her prior work at Stevens Institute of Technology, and has continued her research in multimedia and mobile network performance and system design. Dr. Morreale holds a BS from Northwestern University, an MS from the University of Missouri, and a Ph.D from Illinois Institute of Technology, all in computer science. She holds a patent in the design of real-time database systems and has numerous journal and conference publications. James M. Anderson is the vice president of product management at GSL Solutions, Tampa, Florida, USA, and the president of Blue Elephant Consulting, a business communications consulting firm. Previously, he worked for Boeing, Siemens, Alcatel, Verizon, and a number of start-ups. Dr. Anderson holds a BS and MS from Washington University in St. Louis, a Ph.D from Florida Atlantic University, and an MBA from the University of Texas at Dallas. His research interests include effective network management techniques for very large networks, software as a service (SaaS) products, and software defined networking/networks function virtualization (SDN/NFV). Dr. Anderson has authored over 30 books and has numerous conference publications.